Prepare the ingredients. Place the couverture (chocolate block) in a microwave safe bowl. Make sure bowl is dry since drops of water or oil will ruin the chocolate. Also make sure the chocolate tastes fresh, not modly. Melt chocolate in the microwave oven for about 30 seconds; stir. Heat again for another 15 seconds or until it melts thoroughly. Or temper the chcolate over a pan of baoiled water. Do not place chcolate over direct heat. Stir to smoothen. The melted chocolate should have a smooth texture. In a bowl, combine raisins and marshmallows. You may also use other kinds of nuts or dried fruits. Pour some of the melted chocolate into the bowl of raisins and marshmallows, enough to bind them when mixed. With a small scoop, form chocolate mixture into clusters of desired sizes. Refrigerate the clusters for about 30 minutes so these will firm up. Dip the hardened clusters again in remaining melted chocolate. Refrigerate once more until these firm up. If the melted chocolate thickens while chilling the clusters, heat it again in the microwave at 15 second intervals, stirring until smooth. Couverture is a high quality chocolate with added cocoa butter. To give more gloss, used for coating cakes and confections and for making caraques. It melts mor eeasily than semi sweet chocolate. This is the ideal kind to use. Other varieties sold at baking supply stores are the local premium chocolate or the dark sweet variety. This is what most people use to make chocolate lollipops. 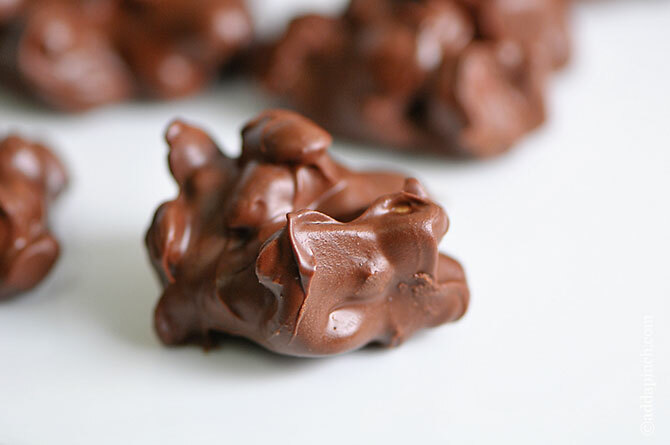 Using imported chocolate, however, makes the clusters more special. End.